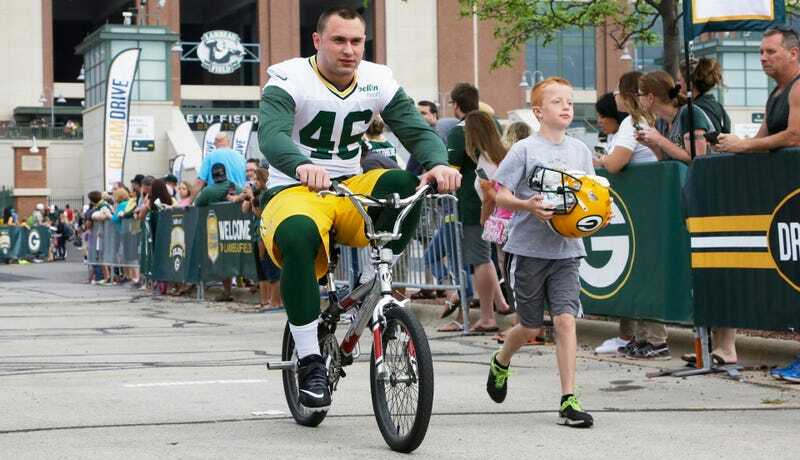 Colt Lyerla played tight end for the Oregon Ducks from 2011 to 2013, and had a cup of coffee with the Green Bay Packers before knee injuries ended his brief NFL career. Lyerla has run into trouble with the law several times since his college career ended, as he was convicted of cocaine possession in 2013 and arrested the next year for suspicion of driving under the influence. The community corrections center is a minimum-security facility across the street from the county jail. The center provides residents work-release and transition programs. Services include substance abuse treatment, mental health evaluation and treatment, employment counseling and job referrals and other programs. The center averages over 2,000 intakes a year with an 85 percent completion rate, officials said. Lyerla will not be allowed back to the community correction center or alternative forms of custody because of his escape, Berger said. NFL speed comes in handy, apparently. Update, 4:24 p.m. EDT: Nah, he got caught within 24 hours.